A hugely popular range of lightweight polyethylene cube planters. 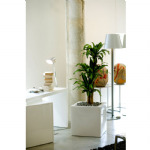 Extremely durable, double wall polyethylene planters. Some even have built in castors for easy movement.